Let’s play a word association game. When someone says “college sports,” what comes to mind? Humility, honor, integrity, and gratitude aren’t words often used to describe collegiate athletic programs these days, what with all the scandals swirling around, but the University of Chicago took the time last Friday to remember some of its athletes who, as well as excelling on the field, did embody those words. 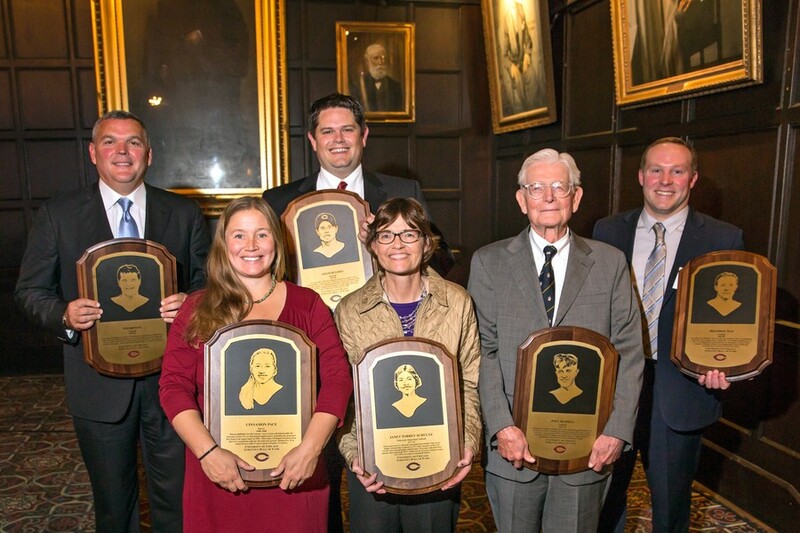 Seven former athletes were inducted into the 11th class of the UChicago Athletics Hall of Fame on Friday night. The inductees were Adam Hughes (A.B. ’98), Cinnamon Pace (A.B. ’00), Gary Pearson (S.B. ’60, SM ’63), Ted Repass (A.B. ’87), Paul Russell (Ph.B. ’16), Janet Torrey Schultz (A.B. ’81), and Brandon Way (A.B. ’99). Their statistics and accolades are impressive, but none gave any indication that those achievements were more important than the camaraderie they’d had with their teammates, the wisdom gained from the tutelage of their coaches, and the life values they’d learned balancing academic and athletic examinations at UChicago. The evening began in the McCormick Tribune Lounge where the inductees, their friends, their family, and other University dignitaries mingled and recounted the memories that they had made during their time at UChicago. Many of the inductees felt strongly about the University’s role in shaping the ethos of college sports. “I arrived at the University five years after Title IX. In fact, my high school didn’t even have a basketball team,” said Schultz, a volleyball, basketball, and softball star . Schultz was a recipient of a Dudley Scholarship in 1977, a scholarship initiative started to attract more female student-athletes. “When I first saw an article about the [positive] treatment of female athletes at the UChicago in Parade Magazine, I didn’t know much about the University. The notion of offering women athletic scholarships was unheard of; it was like a Shangri-La for women’s sports,” said Schultz. One sentiment that was shared by all the inductees was the importance of their teammates. “I had a great relationship with Coach [Brian] Baldea, he was really cognizant of the importance of our academics and how we managed our time,” said pitching ace Adam Hughes (A.B. ’97). “But there were a lot of other great guys too. In fact my best friendship was with my catcher. We started out our first year together, and he caught all of my games until the very end.” The catcher, Jaired Stallard, remains one of his closest friends. During their speeches, the athletes continued to express humility and gratitude to those who had contributed to the success of their athletic careers. After a medley from the UChicago Men’s A Capella Choir, the festivities at the Reynolds Club concluded.